This beautiful Grade II listed house is located in a village in Dorset, surrounded by wonderful gardens and countryside. 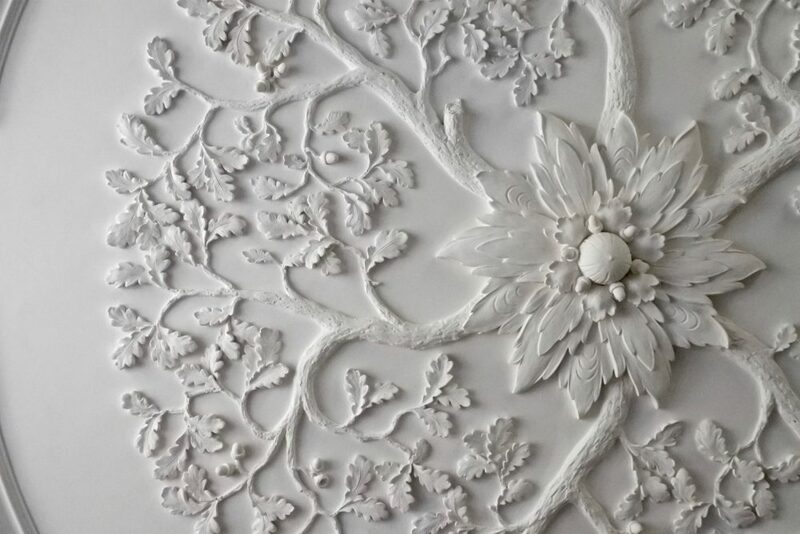 On seeing Jeremy Musson’s review in Country Life of our exhibition Lines of Beauty at the Foundling Museum, the owners commissioned us to make new ceilings for their drawing room and sitting room. The house is predominantly 17th century with some later additions. 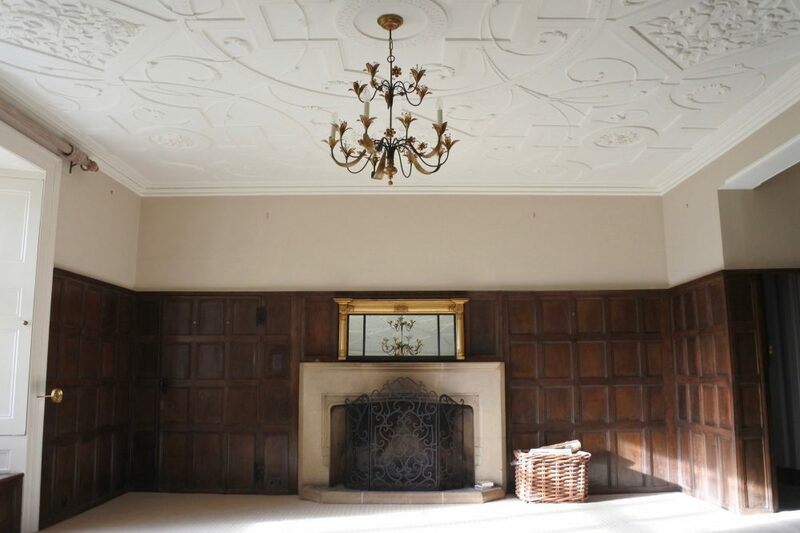 The main entrance brings you directly into the drawing room, a generous space with three quarter height oak panelling and a stone fire surround. On the right is the sitting room, a smaller but nicely proportioned room with windows overlooking the front and rose gardens. The drawing room is 17th century in character and although the sitting room is from the same date, the interior gives the impression of being slightly later. 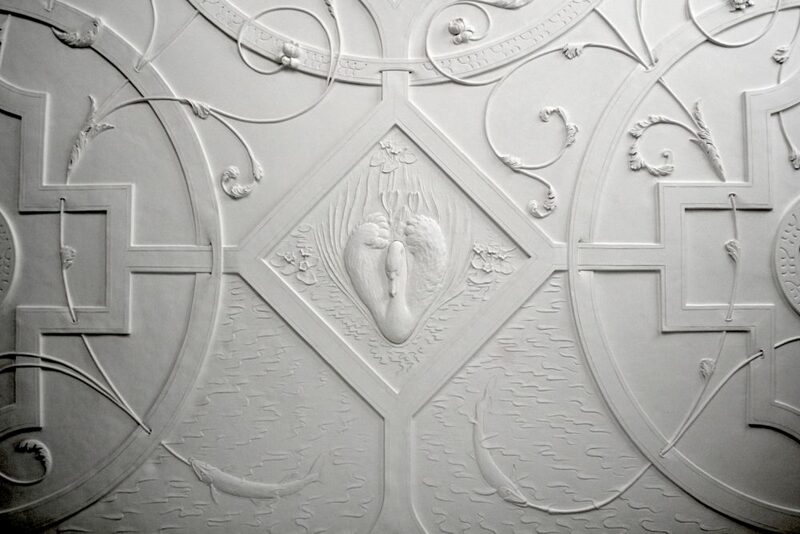 One of the owners, a film director with a keen eye for detail, had seen Wardington Manor in Oxfordshire and fell in love with the unique Arts & Crafts plasterwork there. 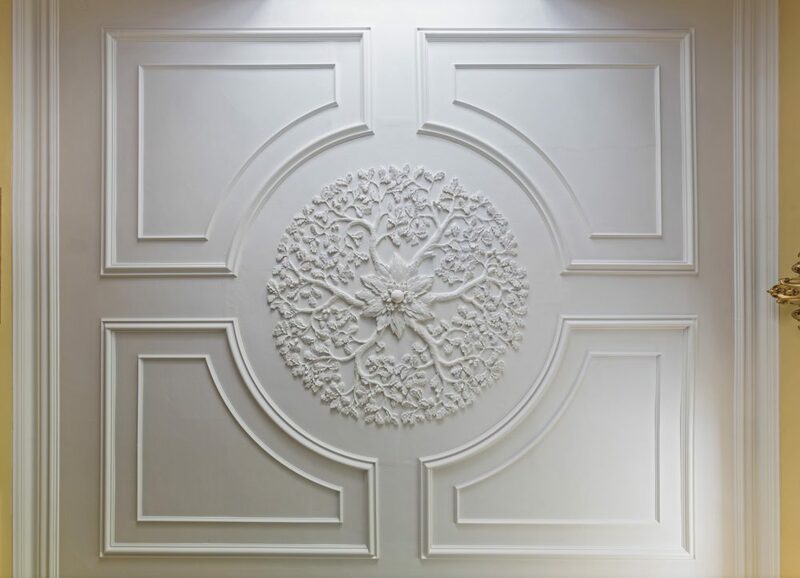 Our brief was to create original ceilings that would be in sympathy with the age of the house, reflect its bucolic landscape, and channel something of the playfulness of Wardington. 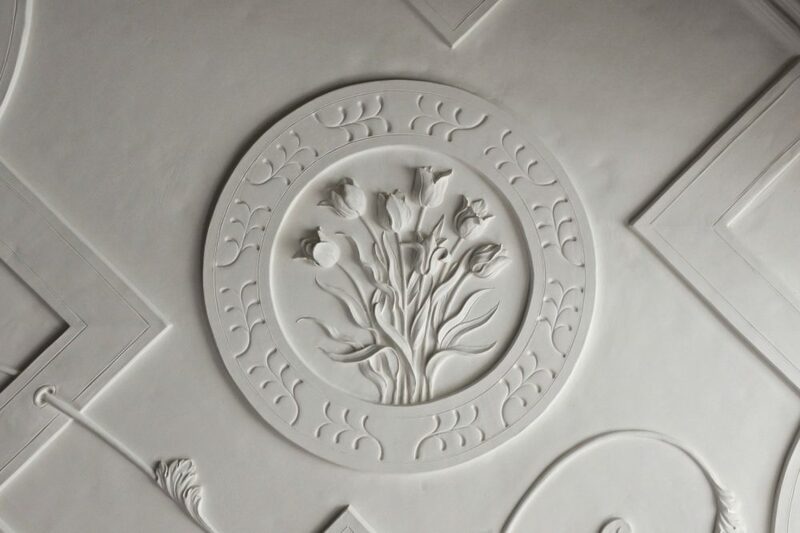 The backbone of the drawing room design is a geometric pattern of strapwork, which reflects the tradition of 17th century plasterwork in the South West. 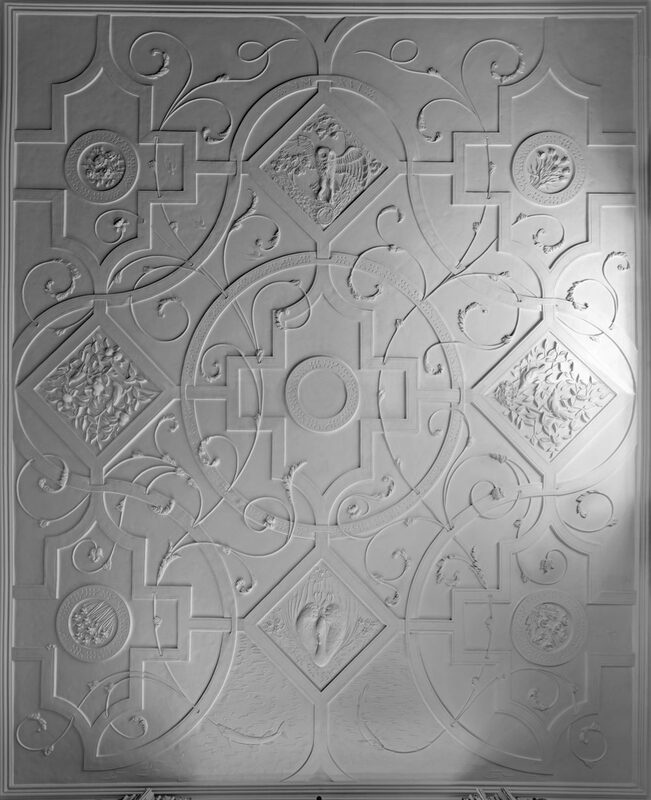 It was also strongly influenced by the Arts & Crafts plasterwork at the National Trust’s Wightwick Manor in the West Midlands. The lines that spring from the mouths of the pike weave through the strapwork, turning into curling tendrils of stems, leaves and flowers. 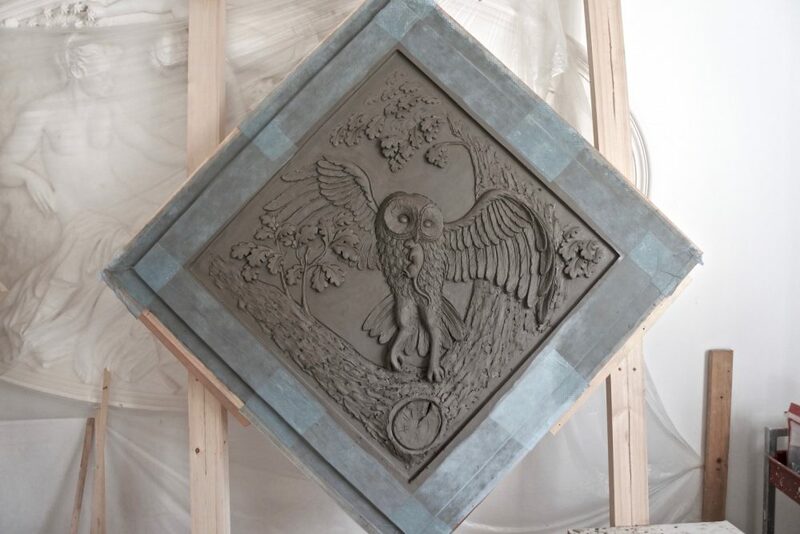 Square panels feature relief sculptures of local wildlife: blackbirds, an owl and a swan. 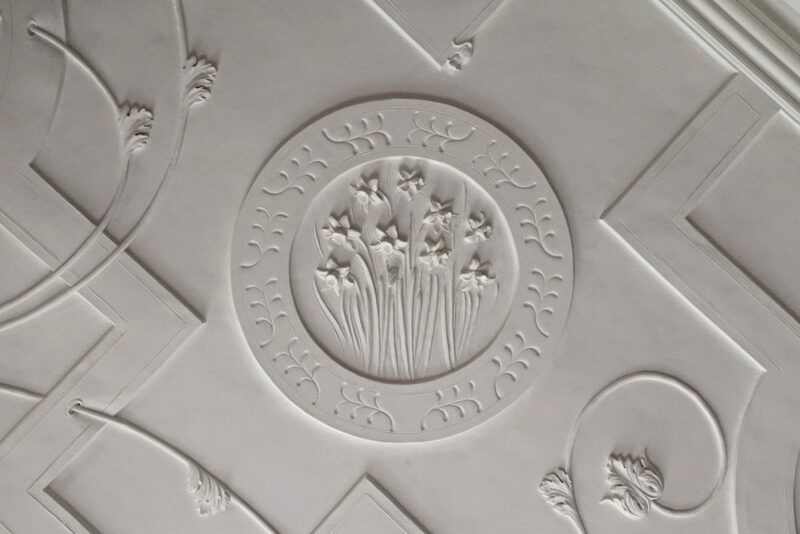 Circular panels contain tulips, narcissi, roses and poppies, which are favourites of the owner. A kingfisher and swallows flit across the background. 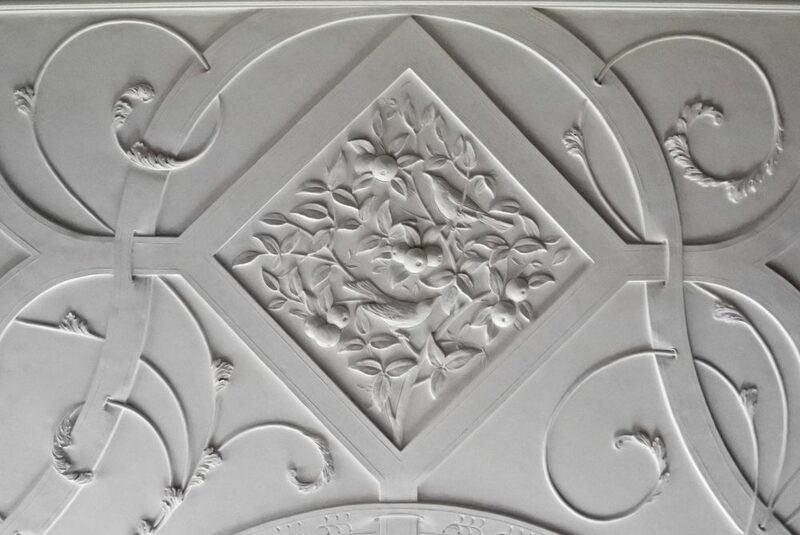 The sitting room ceiling has a centre of oak leaves, some six feet in diameter. Tucked away among the branches are a wren and a pair of mice stealing acorns. 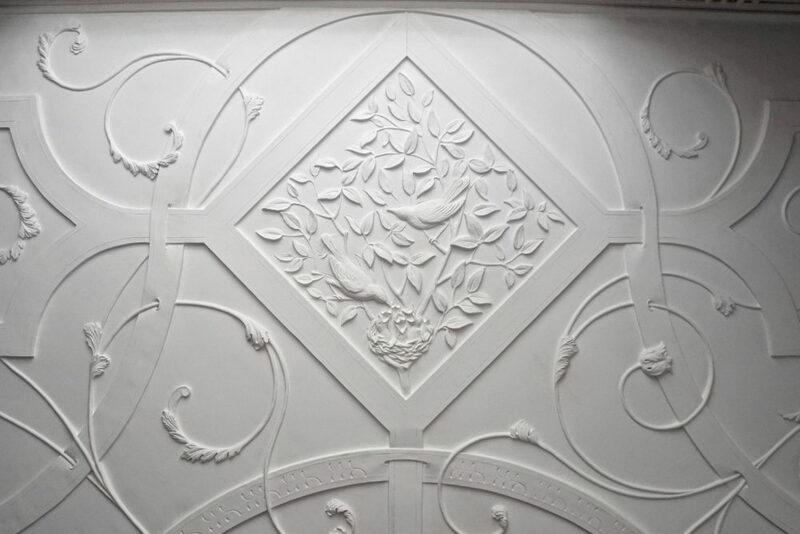 The design is completed by the plain running mouldings which provide a little formality and pull it all together. 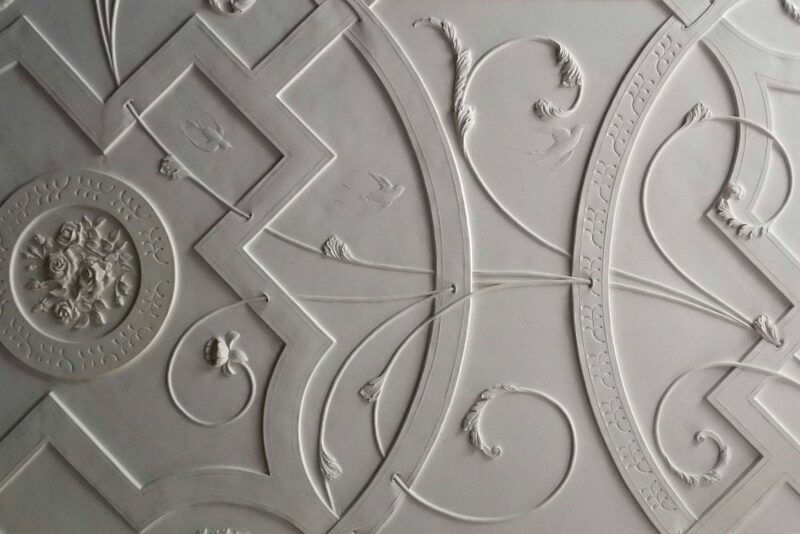 In the 17th century, ceilings like this were made in lime plaster, with ribs run and detail modelled insitu. 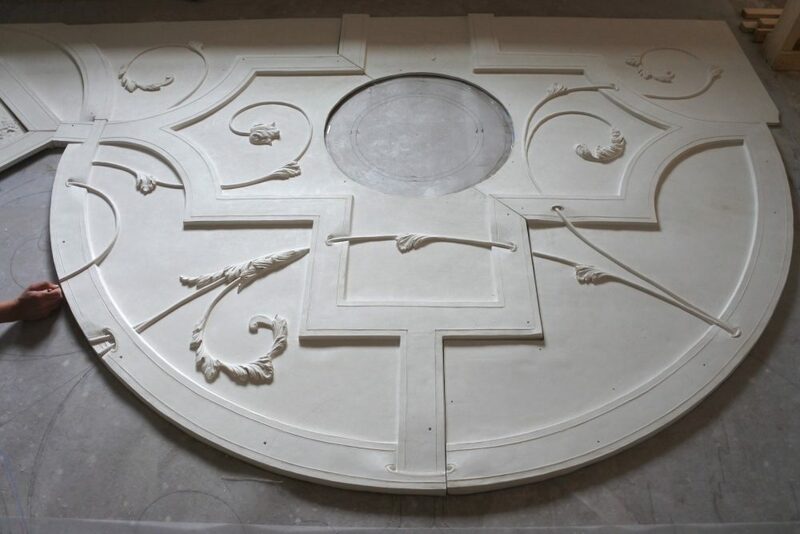 With the passing of three hundred years, many layers of paint, and not a straight line or sharp edge in sight, they have a softness and a character that is hard to replicate with modern methods and materials. The danger, we felt, would be to put a modern ceiling, all hard edges and straight lines, into a gentle and crooked old house. It would look machine made and totally out of place. On the other hand, we’re not great fans of fakery. 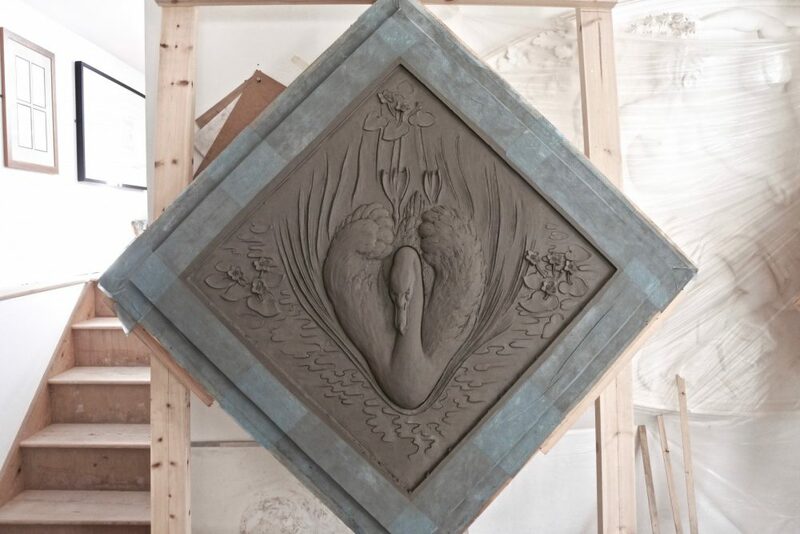 So the order of the day was that the new ceiling should be handmade, lively and fluid. 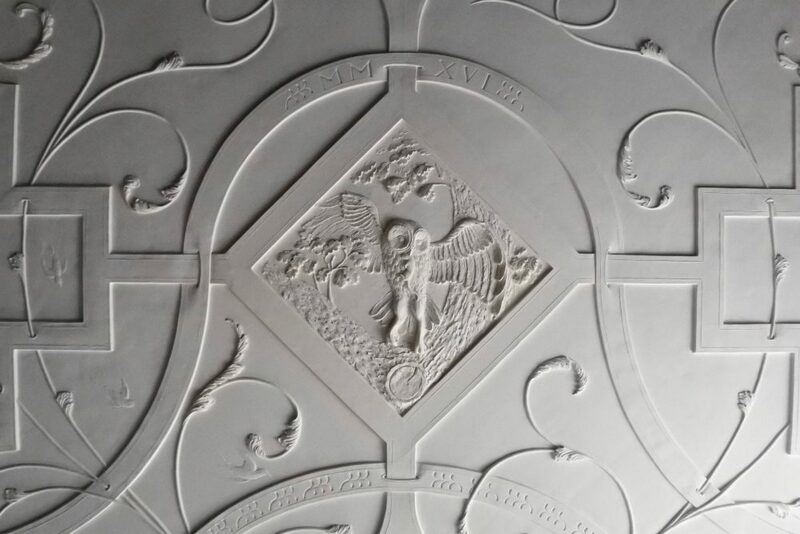 To make the drawing room ceiling, we had the design printed full size onto templates and then divided it into manageable sections. We made up clay panels for each area and dressed these with the clay ribs. We drew into the clay background and gave the flat areas a subtle, dragged texture. 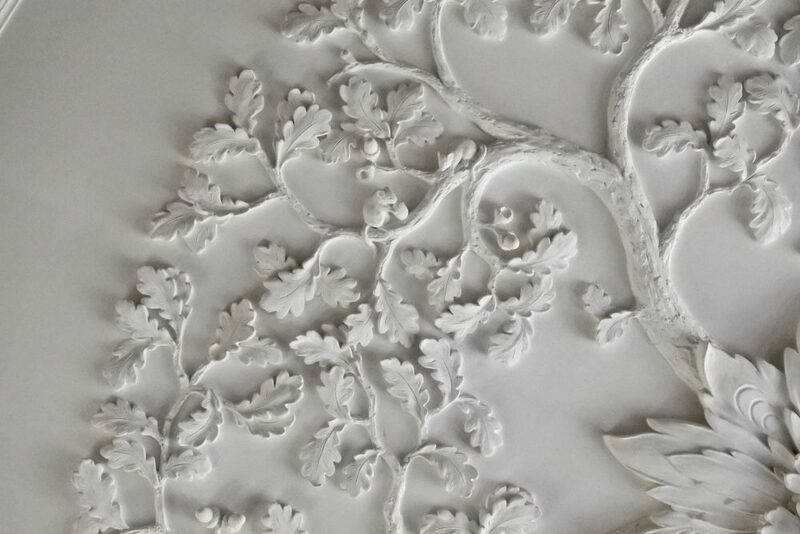 Every surface, rib and tendril was individually modelled by hand. Meanwhile Geoffrey modelled the bird and flower panels. 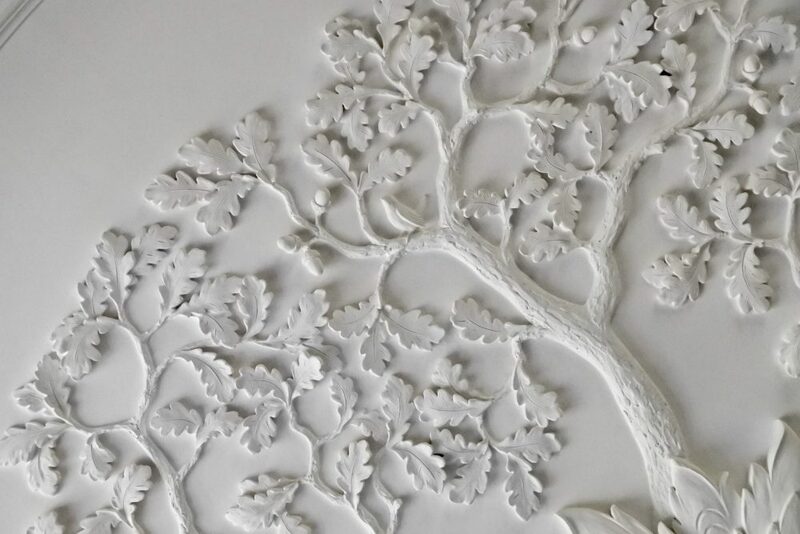 The completed models were moulded and cast – the entire ceiling numbered some 40 casts which all fitted together in a jigsaw puzzle to complete the ceiling, with no repeats. 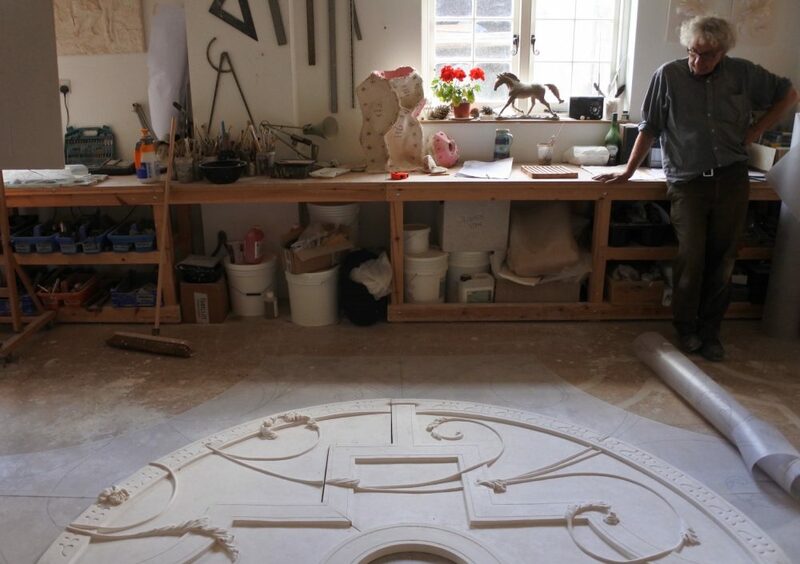 The sitting room centre was made in a similar fashion and the mouldings run on the bench. Many thanks, above all, to our clients for such a wonderful commission. Thanks also to modellers Kate Montagne, Louisa Shorney and Kiri Walker, and to John Fowler, Marc Houghton, Andrew Carswell, Andy Clapham and the team at Clapham Joinery for helping us with the installation. 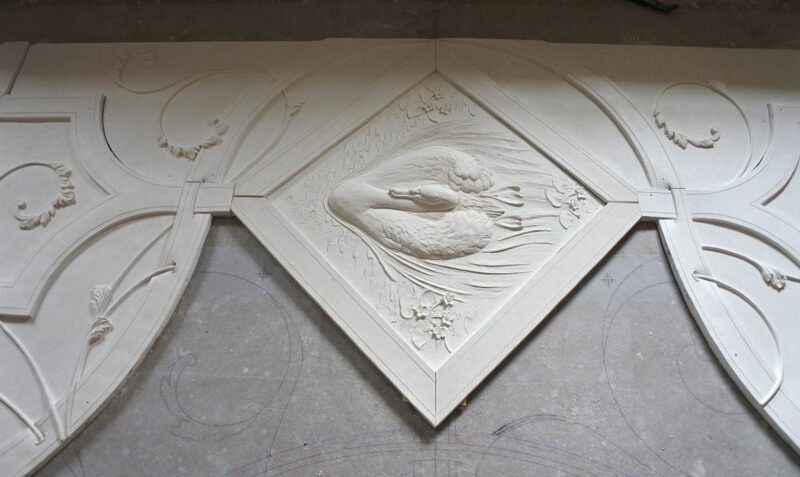 We are currently working on a third ceiling for the house; this time a contemporary design with a central rose depicting a lunar eclipse, and fiery flames (or stars) spinning out from the centre on spiraling arms. Pictures to follow! Click here to find out more about Wardington Manor.